LaBagh Woods in Chicago is part of the Forest Preserve system of Cook County. LaBagh is located between Foster Avenue on the south, Cicero Avenue/US 94 on the west, Bryn Mawr Avenue on the north, and two cemeteries and a subdivision on the east. This Google Map shows LaBagh in relation to the roads of the area (see the aerial photo below also). When I bird LaBagh I park in the lot on the north side of Foster* (about 4500 West) and walk northeast along the gravel embankment until I come to the North Branch of the Chicago River. From there I follow the trails east and west of the embankment along the river. There are other trails west and south of the river that can also be productive. During wet springs these trails can be muddy and treacherous to walk. Birding can be productive from the embankment as well. Additional parking areas can be reached by taking Cicero north from Foster for a few hundred yards and turning right (east) at the LaBagh Woods Forest Preserve sign. Follow the road over US 94 to reach the lots. *This area is called the Irene C. Hernandez Family Picnic Grove. Occasionally the parking lot here is closed early in the morning. If it is closed you can park on one of the side streets south of Foster such as Kilbourn or Kolmar and walk in. The yellow outlined box denotes the approximate boundaries of LaBagh Woods. Note the North Branch of the Chicago River, which runs from northwest to southeast through LaBagh. 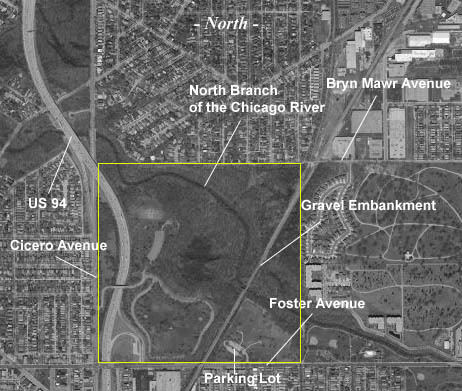 The dark, amoeba-shaped blob between Cicero Avenue and the gravel embankment is the wooded swamp. LaBagh Woods is largely floodplain and riparian forest. Ashleaf Maple (Box Elder) and Silver Maple occur throughout, especially in the wetter, low-lying areas. The drier, more upland areas away from the river support stands of oak and hickory. LaBagh Woods can be excellent in spring for migrant insectivorous passerines, especially warblers. The best time to bird LaBagh is from late April through May. When there's an east or northeast wind in the spring, LaBagh tends to hold decent numbers of passerines compared to the Chicago lakefront parks (e.g. Montrose), probably because of the shelter afforded by the many large trees and the presence of water. LaBagh can also be good for warblers and other passerines in fall but they are often harder to see because the trees and shrubs are leafed out. Public Facebook group that discusses birds and nature at LaBagh Woods. Also includes information about conservation events at LaBagh. Map that shows parking areas, shelters, and restrooms at LaBagh. From the Cook County Forest Preserve District. RDH lives and works in Chicago, Illinois. His background is in webmastering, front-end Web development, and content management.